I've added some new kit to my er, er, ..... kit. 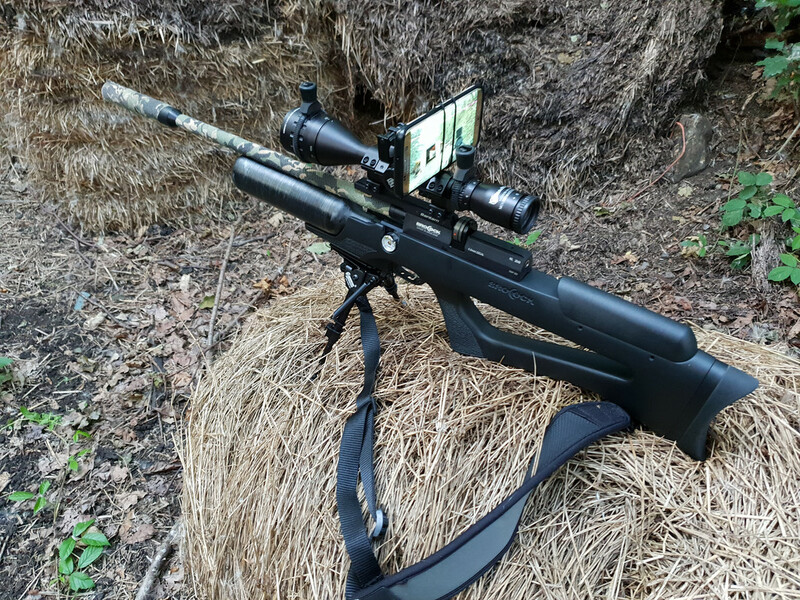 I've added a scope-mounted "action cam"! To be honest, that sounds more sophisticated than it really is. I recently got a new mobile phone so I attached my old one to my scope to see what it could do as an video device. The eagle-eyed among you will have spotted that it is attached to a mount using a couple of hair "bobbles" so it's easily attached and removed. The mount stays on the scope because I use it for my IR torch. I tested it the other day when I was at The Unicorn Farm. Finally I have video with sound (although it'll be no good for night shooting!). In the first video you'll notice that the image gets a lot "fuzzier" as I zoom in on the target. That's why optical zoom is sooooo much better than digital zoom but I'm working with what I've got. Also, the picture doesn't show it but it was a little gloomy where I was recording so, perhaps, it might improve in brighter conditions. I don't think this is going to be a big issue for me because I'm hoping to use this for hunting footage. If I manage to record anything interesting I'll post it. Watch this space (or my Hunting Thread for my hunting clips or visit (subscribe even?!?!?) my YewChoob Channel)! Nice bit 'o shooting perm there Blerkster!!! I'm surprised at how 'farty' that Brocock sounds on discharge.....very much like an old skool unregged PCP that is way down on air pressure. Dunno if you've noticed, but the vid jumps/vibrates as the hammer strikes......maybe it needs to be isolated from the rifle a bit more? It's great. The area in the video is my "zero range"; a nicely sheltered old railway line. Turn 180 degrees and you're looking at the squizzer hotspot. Well, it IS unregged and it's had about 120->140 pellets through it since I filled up. Having said that, the gauge is still in the green. Yeah, I noticed that. As you can see from the pics, it is directly resting against the mount and on the scope. I might be able to put some padding between the mount and the phone, that might reduce the shock-wave. So it is unregged and low down in it's charge........glad to know my ear'oles haven't deserted me yet!! 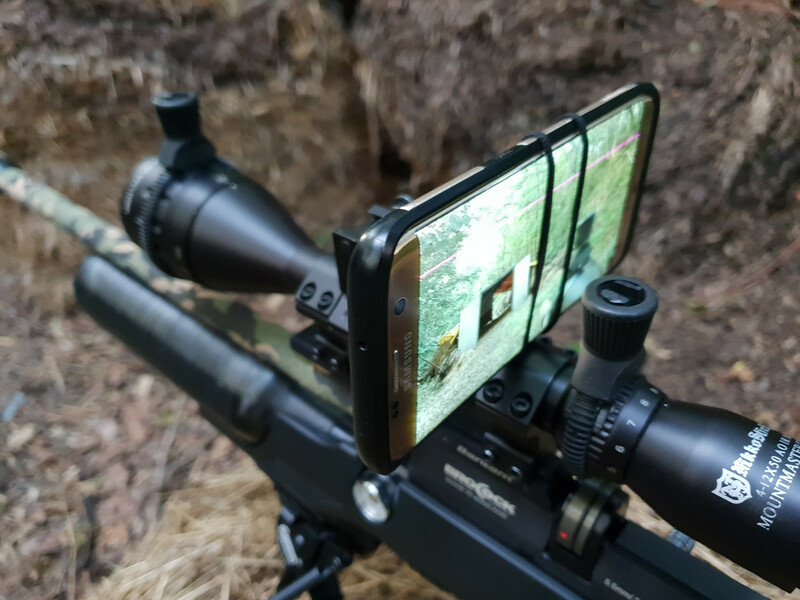 Yes, a bit of padding between scope mount and phone would be great. Why don't you try an Always Ultra with wings......they seem to work perfectly great for everything else!! Only downside is you'll probably have to replace it every 28 days!! Why don't you try an Always Ultra with wings. Check in Mrs Blerk's bottom draw.....you'll probably find some there....with the added advantage that they'll be free!! Douglas Adams once said "A learning experience is one of those things that says, 'You know that thing you just did? Don't do that." I had one the other night. Let's see if you can guess what it was before I get to the point. I went to The Unicorn Farm to see if I could anything for the pot. As I make my way along the access road to my usual parking spot I scan the fields that flank the road, especially through gates. Sometimes I'll spot something that I think is worth walking back to check out or I might even see a potential target. As I was making my way along the road on Tuesday evening I looked through a gate to my left and spotted a couple of pigeons about 15yards away. The car windows were open so I carefully backed up the car to make sure I was hidden by the hedges while I got my rifle out of my bag on the back seat. I put a pellet into the breech and eased the car forward. At first I thought one of the pigeons had buggered off but it had just moved a little. So I was sat there in my car with TWO pigeons pecking about, barely 15yards from me. I raised my rifle. This is the point where most pigeons make themselves scarce but, because I was in the car, they didn't spot the gun and stayed where they were. I looked down the scope and dialled in the AO. The nearest one appeared to be bang on 15yards away. They were quite calm so I settled myself to take the shot: a headshot, calmly taken at the nearest bird. Two pigeons flew away, startled. "What was that bloody noise?" I asked myself. Had I hit the metal gate? Surely not! And it didn't sound like metal being hit with a pellet. And that's when I saw it ............. a hole in the top edge of the inner panel of the car door. I checked the damage. 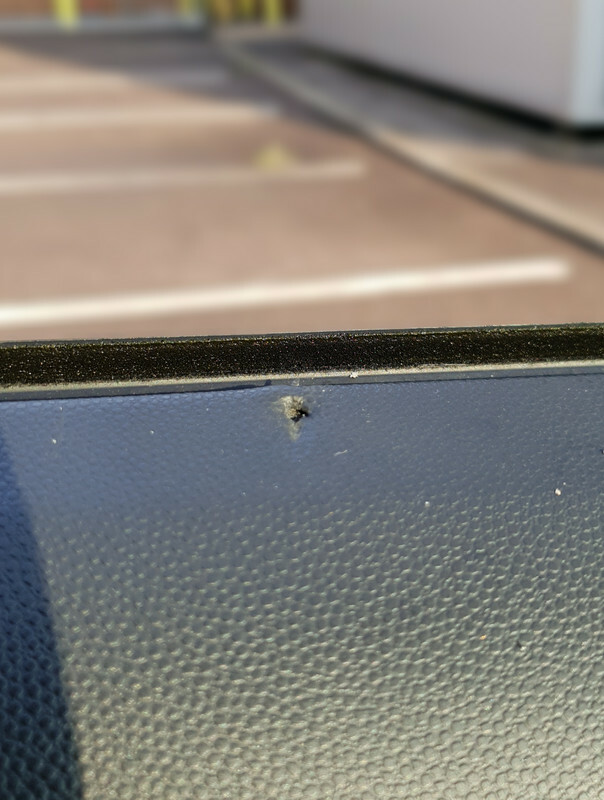 The pellet had gone straight through, right at the top of the door, puncturing the inner panel and slight tearing the rubber seal on the outside. No major bodywork damage and the window was intact. Considering my stupidity I had been lucky. "I shot it. But I'm OK, I didn't get hurt." If I don't get my fingers broken I'll post and let you know if I ever have to make the decision. Schoolboy error : the end of the barrel is a lot lower than the centre line of the scope. Lesson learned : make sure the end of the barrel is beyond the confines of the car when shooting from within. I've done a similar thing twice before, when shooting out of a partially opened bedroom window, and the rear garage door......so I must be as doublely thick as you Blerky. My suggestion is when she eventually spots it.........act surprised and bemused as to how it got there. I know some one who did some thing similar but it was with a .22lr, he was resting the rifle on his open shooting box, shooting away, then he said "who ever is throwing plastic at me please stop." after a few minuets he repeated "whoever is throwing plastic please stop it." a few more mins passed then he yelled "stop throwing plastic!" at this point I stopped shooting and leaned back and looked round in to his shooting cubical, all I said was " ray look where the barrel of your gun is" his reply was "theres nothing in front of me that's plastic" my reply was "no ray don't look through the scope, look at the gun barrel, that's when we all heard the string of expletives, yep, you guessed it the barrel had been inside his gun box but he was looking over the top of it through the scope, the scary thing was that in the box was a black powder flask (full) and muzzle loading percussion caps. He must have shot that box 50 times. She's been in the car a few times since and not said anything. But our youngest lad spotted it when I picked him up from work on Saturday. "What's gone on here?" he asked. "Well. Hmmmm. Yeah," I wittily replied.